Dental implants are man-made “tooth roots” crafted of lightweight titanium, a strong and safe material. 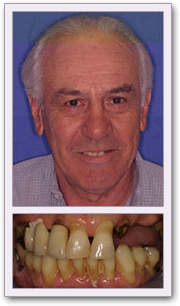 Dental implants are the newest and most permanent way to replace missing teeth. Implants are surgically placed into the jawbone. Once in place, these “roots” can then can be used to attach new teeth, as well as bridges, removable partials or dentures. Dental implants have a success rate of approximately 95%, with best results coming from implants at the front of the lower jaw. The skill and experience of the dentist also contributes to overall success rates, so you need to select your implant dentist carefully. Implant dentistry is not yet a legally distinct specialty, and many dentists are attempting this treatment without adequate training. When you select your implant dentist, look for implant training credentials. With modern anesthesia, you are unlikely to experience any pain during implant replacement. Afterwards, discomfort will be based on the extent of your procedure. Most patients tell us the benefits of their Dental Implants far outweigh any discomfort they experience. We can also provide sedation dentistry during the procedure. 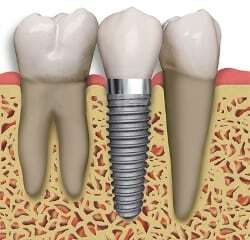 Dental implants are connected with the surrounding bone in your jaw. They have a long-term potential and can last a lifetime when properly taken care of & when they are placed by successful board-certified surgeons, such as Dr. Thein. Yes. In most cases, anyone healthy enough to undergo routine dental extractions or oral surgery can be considered for an implant procedure. Patients suffering from uncontrolled chronic diseases, systemic problems or behaviors and heavy smokers may not be good candidates. Read more about who qualifies to be a dental implant candidate. The dental implant procedure itself is brief. It takes place in a single visit. This is followed by a healing period during which the bonding of the dental implant to the jawbone takes place. Typically, this requires from three to six months. Most patients use a temporary bridge during this period. Is This an Experimental Treatment? No. This treatment has been used for more than 35 years in Europe, and has become an integral part of dental care in the United States and Canada over the past 25 years. Worldwide, hundreds of thousands of people have had missing teeth successfully replaced by dental implants. First ask yourself, can I afford not to get dental implants? With missing teeth, loose-fitting dentures or bone loss your quality of life is greatly affected. Inability to chew food properly, unable to eat the foods you like, premature aging (facial collapse, or a sunk-in look to the face), embarrassing denture clatter and worrying about your appearance shouldn’t hold you back from enjoying life. All these problems can be improved through dental implants. Dental implant costs in Los Angeles vary from individual to individual and are based on different conditions. After your first examination, we’ll accurately assess your dental health and can better answer your questions. Dr. Thein understands your concerns. Many patients in our office have the same concerns. Recently we finished one of our patient’s implant care. His name is Tom and he is a retired railroad worker on a fixed income that hated the dark spaces between his teeth. We tailored his treatment plan to fit within his budget. Now he is enjoying his new smile. We can do the same thing for you. Read more about how we try to make dental implants affordable. Making dentistry affordable is very important to us. That is why we make every effort to keep down the cost of your dental care. We provide a free private consultation relating to any dental problem of your concern. We will answer all of your questions. We will go over all of the charges in advance and we won’t start any dental treatment without your approval. If you have dental insurance, we will work with you to assure that you receive the maximum benefits to which you are entitled. We accept Visa, Master Card, Discover and American Express. Although some insurance plans will cover a portion of the cost of dental implants, most will only pay for the procedure if you are replacing a tooth lost as the result of an accident. Our office can help you find out what your dental plan provides. Dr. Thein explains the pros and cons of a dental implant vs. a dental bridge. If you are missing all your teeth, here is some information about complete dentures and why they should be supported with implants. Snap-on dentures are an economical way to use implants to greatly improve the function of your dentures. If you are missing multiple teeth but have some natural teeth left, read this page about removable partial dentures, which compares them with implants. When you are missing your natural teeth, in a few years you will experience facial collapse. But dental implants can prevent facial collapse. Dr. Thein explains the causes and prevention of dental implant failure. Since implant dentistry isn’t a legally distinct specialty, many dentists are attempting to place them without adequate training, which contributes to this problem. Read about what causes loose dental implants and what to do about that. Find out why many dental implants experts refuse to place the new mini implants. They simply aren’t strong enough to reliably support teeth. Another new technique that is being promoted in advertising is the All-on-4 dental implants, which claims to be able to avoid bone grafting in cases of facial collapse. 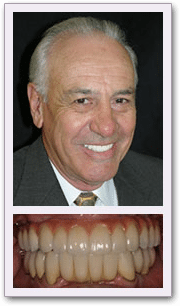 Dr. Robert Thein provides dental implants in Los Angeles and surrounding locations: Glendale, La Crescenta, La Canada, & many others.